First off I need to credit Raj Apte. Certainly one of my fermentational inspirations and a pioneer (or would it be a re-pioneer?) in many home fermentation media including ginger beer plant and sour beers. After reading about and listening to his description of the “$1 Homebrew Barrel" I decided to make two and use them on a Flanders Red and a Lambic I brewed last summer. Those two beers still have a few months/years of aging in front of them so I can't give a definitive evaluation of their flavor, but the last time I sampled them they were both doing well. 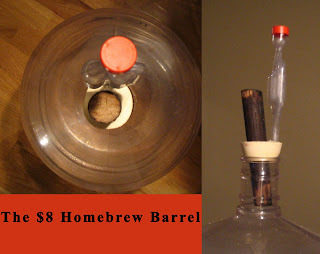 The “$1 Homebrew Barrel" is pretty simple, take a tapered piece of oak (like an unfinished chair leg from Home Depot) cut it off, toast it over a flame, wrap the middle with Teflon tape and jam it through the neck of the carboy and into your beer. According to tests Raj has run the oxygen transfer rate of this system is similar to that of the large (20,000 L) tanks Rodenbach uses to age their sour red. Because of how large these tanks are their surface to volume ratio is very low meaning that they transfer less oxygen to the beer than smaller (55-65 gallon) commercial wine barrels and far less than the (5-15 gallon) barrels some homebrewers use. The other advantage of the system is that they are far cheaper to make and require virtually no maintenance. 2. When pressure builds up faster than it can diffuse out of the wood beer is forced out through the wood. This can happen either because of a strong secondary Brettanomyces fermentation or because the temperature of the carboy rises causing CO2 to come out of solution faster than it can diffuse through the wood. This is an annoyance and can also lead to poor sanitation, in my case after some liquid got out it allowed mold to start growing on the bottom of the fridge that the carboys were stored in. Despite these difficulties I think that this is a good system that could be great with just a couple of tweaks. I have personally stopped using glass, it posses the risk of suddenly breaking and it can be pretty heavy when full of beer. As a result I now use Better Bottle, so that is what I used for my project. The manufacturer of Better Bottles claims that they are impermeable to oxygen, but that claim is still up for debate in the homebrewing community. The larger stopper Better Bottles use also allows room for a wooden peg and an airlock to be put through it. Having the wood wedged into the stopper will make removal easy and the airlock will prevent pressure from building up by allowing CO2 to escape much faster than it can diffuse through the wood. I started with a trimmed and toasted oak chair leg prepared just as Raj described (cut to about 7 inches and toasted over the flame from my turkey fryer). I then took the rubber stopper and used a knife to cut a new hole near one edge for the airlock. I then used the knife and slowly whittled/twisted/gouged a large hole starting near the other edge and going just passed the original airlock hole. This took about 20 minutes, but really wasn't that difficult once I got the hang of it. There is a small gap in one spot between the stopper and the wood, I will seal this with some food grade silicone sealant. All in all the project cost me about $8. About $5 for the oak, and $1.5 each for the stopper and airlock. Not bad when you consider a new homebrew scale barrel is at least $150 and would let in far more oxygen and would impart too much oak character to the first few beers that were aged in it. That is actually just a leftover piece of oak from my original attempt at the Raj chair leg system (it was the only thing I had lying around when I got inspired to work this up). It probably should be an inch or two longer (or maybe I should make the hole a bit bigger and stick it in further), but you really don’t want too much contact between the oak and the beer. Check out page 8 of http://www2.parc.com/emdl/members/apte/GingerBeer.pdf it’s hard to tell exactly how long Raj’s is, but it doesn’t look too much longer than mine. Oak flavor can get really strong over just a short amount of time, as I learned when I left 2 oz of oak cubes in 3 gallons of barleywine for 2 months about a year ago. Particularly in sour beers, where you may want it to age in contact with wood for more than a year, you generally don’t want a strong wood flavor because it can overpower the more subtle flavors. In the original setup the oak had approximately as much surface area as .5 oz of the oak cubes/beans from StaVin. You want as little head space as possible so you would need to keep the beer topped off to within an inch or so of the top (you can either use boiled and cooled water, or beer). Head space (and particularly oxygen in the headspace) encourages the growth of acetobacter which just loves turning alcohol into vinegar. Of course this is still an untested system so there will likely be some bugs (like the optimal length and treatment of the wood) to work out before everything is said and done. I just wish that I didn’t have to wait so long to get the results from a project like this. So, did it work well? Or would you advise just going with oak cubes? I've given up on these. These days I'll do oak cubes if I'm aging in a carboy or better bottle. I just didn't find the results from any of the oak peg/dowel methods to be any better than results with the simpler solution. Barrels are another story, sadly I've yet to find an easy way to replicate them on a small scale. Here: http://www2.parc.com/emdl/members/apte/GingerBeer.pdf ? I think that is just a small hole for attaching the chair leg to the rest of the chair, not a hole drilled all the way down by him. I'm not sure, but it seems like the sort of thing he would have written/mentioned if it was part of his process. A hole all the way through the wood might also cause acetic and evaporation issues as well as give a route for bugs to get down into the beer. You're right!But What about drilling a hole large enough so an airlock would fit in! I will try it and let you know! ( by the way I've been following your blog for almost 3 years, and this was my first post). You are a great source of inspiration for brewers here in montreal! If ever you're having a trip here in Mtl, let me know! My knowledge of how pressure works is pretty minimal. As CO2 is released by the beer most of it would build-up in the headspace, as this happens it exerts a downward pressure on the beer, I’d be worried that the easiest place for it to go would be up and through the airlock until the level dropped below the bottom of the oak peg. That is essentially what happened to me the first time I used just the oak peg, beer kept bubbling up through the wood. Glad you’ve enjoyed the blog, I always appreciate hearing that. Seems like lots of interesting beer being made up your way, just got to try a fantastic bottle of La Buteuse Brassin Spécial (an apple brandy barrel aged, funky tripel from Le Trou Du Diable). I know this is an ancient post, but I have a few comments. I use glass carboys. But you could accomplish something similar to what you do with plastic by using a stopper reamed out wide and then buying an oak dowel rod from a hardware store. You can get a 3' long, 1/4" or 1/2" diameter rod for about $1-$3. Then if it swells, no issue. Just stick the dowel rod through the stopper and into the carboy. How do you determine if dowels (or chair legs, or anything else) have been treated with antifugal chemicals? I've tried growing mushroom spawn on storebought hardwood dowels with poor results. I'm less worried about anything killing the yeast, more worried about the potential for chemicals getting into my brew? I'd suggest going to a local hardware store that has knowledgeable employees. That'd be your best bet for figuring out if the wood is safe. Contacting the manufacturer is another option. Mike, thanks for the fascinating discussion. I got really excited about the possibility of doing this as I read your post and I took a break to find and read Raj Apte's original essay. By the time I had finished the rest of your post and thought about it for a while, I had talked myself out of it again. I felt vindicated when I saw your own message saying that you are back to using oak cubes with a carboy or bottle. It's like I ran through the experience of a couple of brews without even heating the water in my HLT. As always, your blog is a fantastic source of information and inspiration.